The lawyer who survived the December 21, 2018, Bacolod-Silay Airport Access Road ambush in Talisay City that killed her fiance, named the alleged suspects she claimed conspired to kill her. The suspects, also through an ally, meanwhile said in a press conference yesterday they were “shocked” to have been tagged as responsible for the ambush. The National Bureau of Investigation (NBI)-Western Visayas Regional Office on Monday filed murder and frustrated murder charges against several policemen and civilians for conniving to kill lawyer Erfe del Castillo on Dec.21. Murder charges were filed for the death of Del Castillo’s fiance Efren Palmares Jr., and frustrated murder charges for the lady lawyer’s, at the Office of the City Prosecutor in Talisay. In a press conference Monday afternoon, Del Castillo identified the suspects, who were recommended for prosecution by the NBI, as businesswoman Catherine Berioso-Cabuga alias Kate Brios, her mother Shirley Berioso, her sister Caselyn Berioso-Ortiz, former Mayor Atty. Jose Max Ortiz, former Bacolod PNP OIC-Chief Sr. Supt. Francisco Ebreo, Supt. Richie Yatar, Sr. Insp. Adrian Albaytar, SPO2 Joshua Barile, PO3 Ronald Ortiz, a media practitioner, John and Jane Does. The charge sheet was filed on February 4 and was docketed as Case No. VI-21-INV-019B-008-009. Aside from Del Castillo, Palmares’ mother Rosalia Palmares is also a co-complainant. The lawyer said in her sworn statement executed before the NBI, that all the suspects connived to have her killed. There was conspiracy to kill her and her fiance, pointing to the ambush that was either participated, induced, financed and/or cooperated by several persons, she stated. On October last year, a stand off took place between the opposing Cabuga couple Catherine and Francis and their supporters at a hotel the couple owns in the city. The incident forced the police to close the busy road fronting the hotel. Del Castillo is the lawyer of Francis Cabuga, while Joemax Ortiz is Catherine Berioso-Cabuga’s counsel. “The motive behind the attempt on my life was self interest, greed and money,” Del Castillo said in the press conference. “My mind was still alert at the time of the (ambush) incident along the Circumferential Road up to the time of my operation (in the hospital),” she pointed out, adding that she never passed out. Despite her wounds, the lady lawyer survived. The shots fired at them while inside their running Porsche car during the ambush were intense, she said. Del Castillo said she saw who shot her, including a fellow lawyer’s bodyguard. She claimed she even heard to whom the suspects reported, that they believed she was already dead after the incident, as well as the individuals who were in the vicinity. “That area in Talisay was well lighted … also by the headlights … so I remembered all of them,” Del Castillo added. She said she was the target of the ambush, saying all the shots were aimed at the passenger side where she was seated. She said more who were involved in her ambush will also be named soon. “Their involvement will soon be established,” she said, adding that they are making sure the evidences are fool-proof just like what they did to the suspects they have already identified. Del Castillo said she sought the assistance of the NBI regional office because she cannot trust the local police. 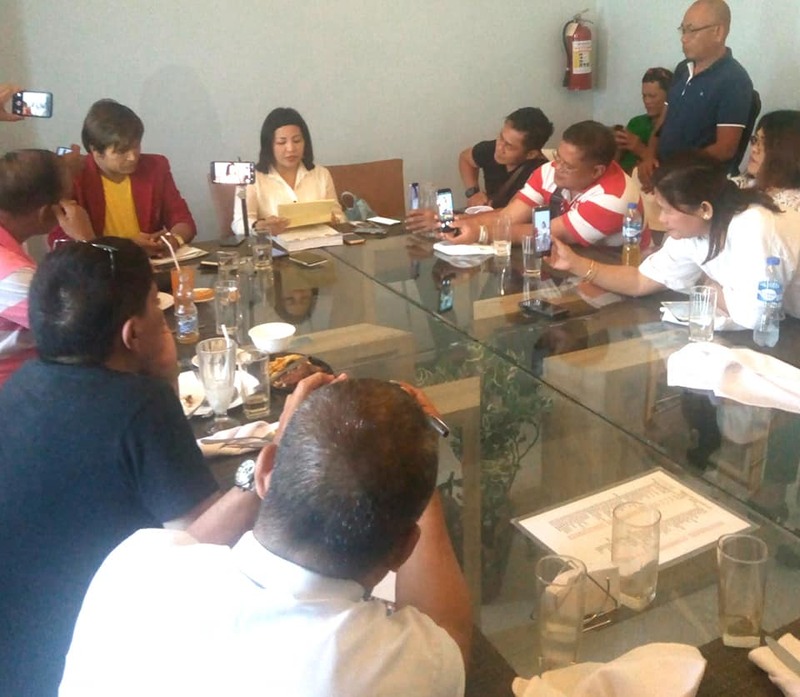 In a press conference in Bacolod, Task Force Kasanag (TFK) national commander John Chiong enchoed the reaction of the named suspects in the ambush of Del Castillo and Palmares. “They are shocked to be tagged as conspirators. They deny any involvement,” Chiong told newsmen. Atty. Ortiz, one of the suspects, is also the legal counsel of TFK. Chiong, at the presscon questioned the procedure of the NBI in handling the investigation. “Why (Atty.) Del Castillo was the one who disclosed to the media the names (of suspects) and why not the NBI faced the media in that presscon?,” he said. Chiong said the alleged conspirators remain as suspects unless and until the court find them guilty. He said he will bring the matter up to the national NBI office.